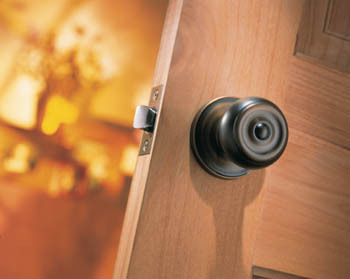 The Welcome Home series of door knobs by Weiser™ come in a variety of unique styles and multiple finishes to choose from. With such a wide selection you're sure to find one that complements your taste. The Phoenix knob has decorative accents that will complement any home decor with a variety of finishes to match. It has a Grade 2 certification by ANSI/BHMA (American National Standards Institute/Builders Hardware Manufacturers Association). The Phoenix knob also features Weiser SmartKey® re-key technology. This allows you to re-key the lock yourself in seconds (depending on the function). SmartKey cylinders feature a stainless steel side locking bar, racks, and pins for increased strength and security. The side locking bar offers improved security by protecting against lock bumping, an attack technique used to defeat convention pin and tumbler locks. 101: Passage/Hall/Closet - Both knobs are always free. 331: Privacy/Bed/Bath - Both knobs can be locked or unlocked by a turn button inside. The outside knob can be unlocked by an emergency key. 531: Keyed Entry Knob - Both knobs can be locked or unlocked by a key outside or a turn button inside. 581: Storeroom/Vestibule - Outside unlocked only while key is turned. Inside is always free.